Every year, Iranians gather to celebrate the end of the old year and the start of the new with an ancient fire-ritual ceremony. And every year, the festivities are shut down by police. On Tuesday evening, Iranians celebrated in Abu Dhabi to mark the occasion with a determination as strong as the flames that light up the night. 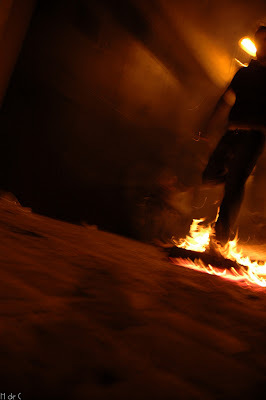 Chahar-shanbeh-soori, as it is called in Farsi, is a festival dating back more than 2,500 years. The ceremony is a prelude to Norouz, the Iranian New Year, which begins with the arrival of spring on the vernal equinox. On the last Tuesday of the year, families and friends gather together at sunset and torch a series of small bonfires. “May your rosy red glow be mine, and my sickly yellow pallor yours,” they chant as they make these sometimes precarious leaps over the fire. During this purification rite, one asks to be rid of sickness and problems, and to be blessed with warmth and energy in the new year. Every year, however, citing safety concerns, officials shut down the events early. The year before last, revelers were asked to leave the Intercontinental Hotel because of difficulties associated with obtaining insurance and permits. The tradition, rooted in Zoroastrianism, predates Islam and holds no religious significance. Attempts to ban Norouz festivities after the Islamic revolution of 1979 were unsuccessful as well. Today Muslims and non-Muslims continue to celebrate throughout Iran. The fire ceremony transcends age limits, too. Sometimes parents partake in the ceremony more enthusiastically than their offspring. “It’s a nice culture,” said Saeed, 10, of Lebanon, who had tagged along. His friend, Sepanta, 11, said he missed the more grand Chahar-shanbeh-soori celebrations of the past. “The hotel was fun,” he said. “There were long tables with ice sculptures and things.” He glanced at the picnic tables stacked with plastic containers and bags, and looked a bit disappointed. Ghafour, an 83-year-old grandfather visiting from Tehran, was helped out of his chair by his daughter. He made his way slowly to the edge of a bonfire leaning on his cane. Another Chahar-shanbeh-soori tradition is to go door-to-door covered up in a chador or some other form of disguise. Banging pots and pans with their spoons, the real objective may not have been to receive treats, as is ostensibly the case, “but for young single men and women to perhaps get a look at one another”, said Marzieh, who was spending her first Chahar-shanbeh-soori away from family in Iran this year. The first group of about 40 packed in a few good rounds of fire-jumping before being shut down by police. “Are you Shia?” the arriving policeman asked. “Sunni and Shia,” replied 9-year-old Ava, an unlikely interlocutor. Few of the parents spoke Arabic, and the policeman did not speak English. “You worship fire?” the policeman said. No sooner had the policemen filed their reports and turned to leave when someone switched on the jukebox and Iranian music started blaring into the air. The bonfires that were meant to keep the sun burning late into the next morning were extinguished, but people had flung their arms into the air and had started moving to the beat of the music. More Iranian families clutching plastic bags of goodies started to trickle in, and the crowd kept swelling. You are currently browsing the archives for the Abu Dhabi category.